The Western media have forgotten those who have suffered the most in the Ukrainian civil war—the eastern Ukrainians. On a bluff overlooking the Sea of Azov in the southwest corner of Russia—tucked between the city of Rostov-on-Don and the town of Taganrog—sits a series of six unprepossessing buildings on dirt lot roughly the size of an acre. Living in these plain cinderblock dwellings are over fifty school-age children and their mothers, refugees from the war that has been raging in the cities, villages and towns of East Ukraine’s Donbas region for nearly a year. These mothers and children probably do not have very good chances for happy futures; they lack means and they lack opportunity. Their separatist husbands and fathers are still in Donbas fighting against Keiv’s regular army and ultra-nationalist battalions or else have been killed. For many, the homes they once knew have been destroyed and the country they were born into is now very far along the process of disintegrating. Yet. for all that. these refugees in Russia, by the sea, are the lucky ones. They got out. Many have not. For four days last week (March 24-27) I and a small group of other foreign journalists*, visited the largest city in the Donbas, Donetsk, and several surrounding towns and villages. Today, Donetsk, which had a pre-war population of well over 1 million inhabitants, seems on the verge of a humanitarian catastrophe. 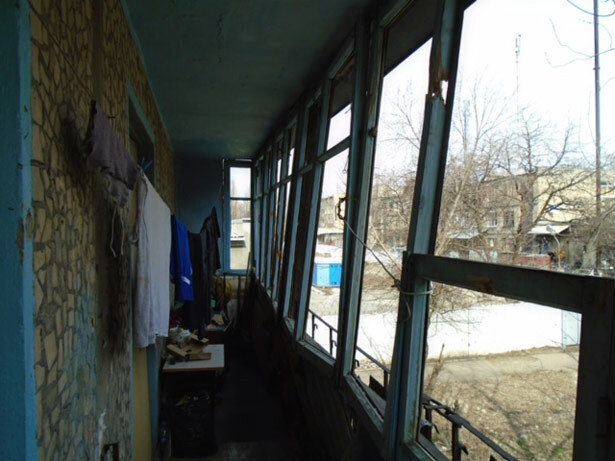 In several shelters in and around Donetsk we saw scores of children—some as young as three days old—and their mothers (and many cases their grandmothers) living in cramped, dirty hovels with limited access to electricity, food and water. The sound of artillery shelling could be heard not far off from the Donetsk airport where fighting between the separatists’ Army of Novorossiya and the Ukrainian forces has sporadically flared up, despite the fact the the second Minsk cease-fire has, for now, largely held in other parts of Donbas. The cease-fire, which is being actively undermined by Kiev’s refusal to negotiate directly with the rebel government, has, according to several rebel fighters we spoke to, not prevented snipers from taking up positions in abandoned apartments throughout the city. Though the targets of sniper fire have mainly been rebel parliamentarians and members of the burgeoning Donetsk government, the fear they inspire among the non-combatants is real. 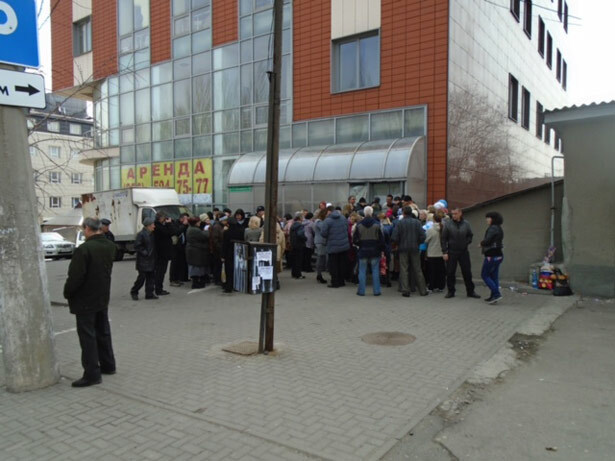 Residents of Donetsk line up in the morning in the city center for foodstuffs and other supplies provided by Russia. Unremarked upon by the American media, eastern Ukraine’s elderly, women and children are living in a city that is effectively under an economic and military blockade by the Western-backed government in Kiev; which has resulted in a very real sense of privation throughout the city. The Poroshenko government, as one of its first moves, cut off all social services and benefits to the citizens of the Donbas; because people are living without medical insurance, hospitals are offering their services for free. Kiev has also cut the area off from the banking system; there is no access to credit or even the most rudimentary banking services. Unsurprisingly, commerce has ground to a standstill; in the city center only small markets selling flowers, crafts and, occasionally, food seem to be doing much business. Medium-sized enterprises, retailers and restaurants, are shuttered, as are, according to one parliamentarian we spoke to, most of the Donbas’s primary large-scale industry: coal and steel enterprises. Only the main Donbas Metallurgical facility is still operating. The deep anger toward both Ukrainian President Petro Poroshenko (I was told by one young woman, a native of Donetsk, that “this is Poroshenko’s war”) and an equally deep sense of alienation from the Ukrainian state in Kiev are equally unmistakable. One young mother told us “there is no ‘back’ to Ukraine for Donbas.” If Poroshenko and his cheerleaders in the Obama administration and the US Congress believe that an economic blockade, Kiev’s deployment of snipers, the shelling of Donbas’s civilians and a proposal to send American weapons with which to facilitate the shelling is the recipe for winning eastern Ukrainian “hearts and minds” they couldn’t be more wrong. Yet, tellingly, this is the strategy Poroshenko himself laid out last November in a speech in which he declared:“Our children will go to schools and kindergartens, theirs will be holed up in the basements. Because they are not able to do a thing. This is exactly how we will win this war!” Well, he may have half the job done. The little children we saw are indeed cowering in filthy conditions in underground Soviet-era bomb shelters. Our hearty band of neoconservative war boosters—from Rutgers University professor Alexander Motyl to the mendacious Assistant Secretary of State Victoria Nuland—might take a moment to consider the misery which their backing of Kiev has brought in its train, though of course they will not. 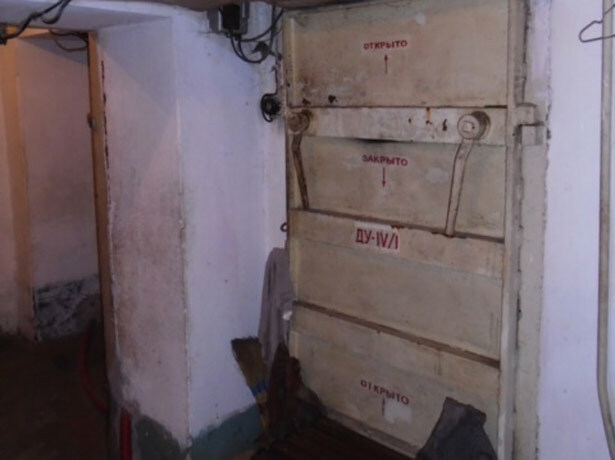 Entrance to an underground Soviet-era bomb shelter take currently is home to around eight elderly woman and four school-age children in Donetsk. It is a remarkable aspect of the current conflict that the people who have suffered that most as a result of the Ukrainian civil war, the eastern Ukrainians, have received little sympathy from Western media that are usually only too eager to cover the hardships brought about by war. The reason is neither hard to divine, nor is it lost on people we spoke to in Donbas. It is hard to escape the conclusion that the Russian-speaking population of the Donbas is being subjected to a conscious campaign of dehumanization that is being waged primarily by private armies funded by Ukrainian oligarchs. Because the people of the Donbas are ethnic Russian speakers, their suffering is discounted. After all, how could people who are seen to be positively disposed to Mr. Putin’s Russia and are fighting an American-backed government in Kiev be deserving of our sympathy? 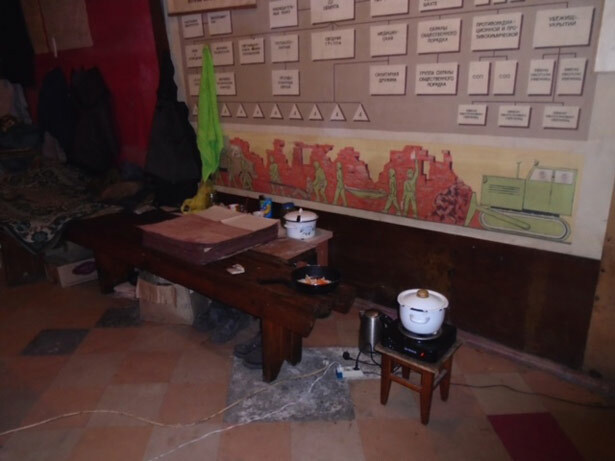 The bunker’s “kitchen” next to one of the residents’ cots. *The author would like to gratefully acknowledge staff of the German-language webzine Europe Objectiv for help in arranging travel and security.